“Who let the dogs out?” That's the song that should be humming in the background while you pick and choose between the Samsung Galaxy Mega 6.3, or the Huawei Ascend Mate. There is nothing compact or ergonomic in phones of this magnitude, unless we add the obligatory “for the screen size” reinsurance quote. 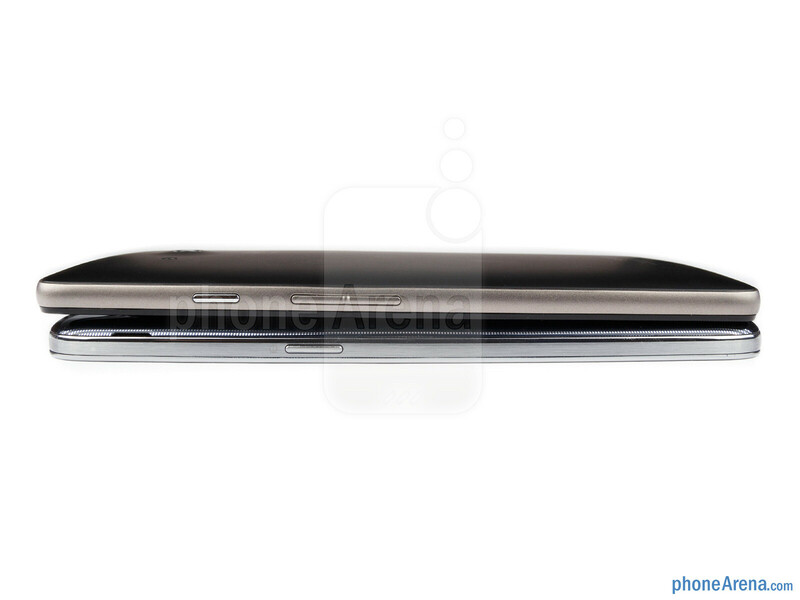 The Galaxy Mega 6.3 looks more polished, with slimmer chassis and appealing cover pattern. 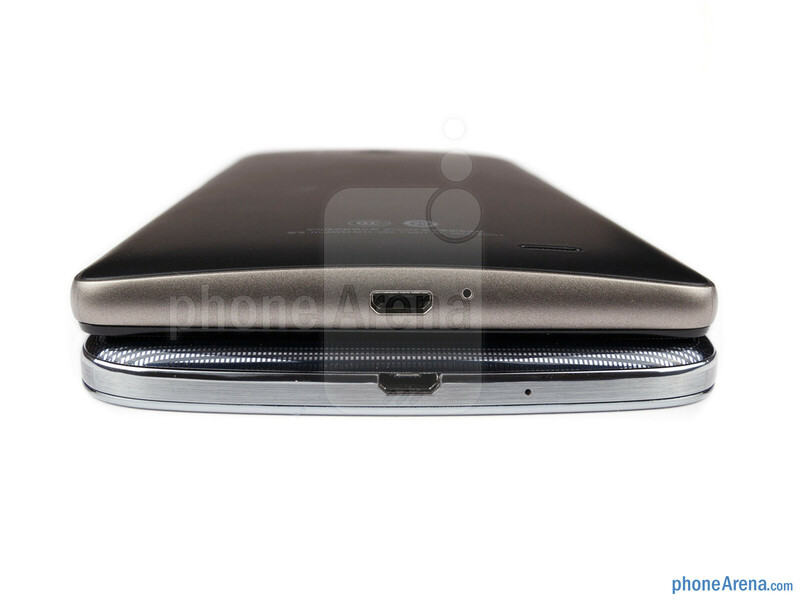 The Huawei Ascend Mate is chubbier, and its body looks more roughneck, thanks to the coarse side rim and the basic quality soft-touch plastic on the back. It is, however, shorter and more narrow than the Mega 6.3, due to the slightly smaller screen, but still every bit as unwieldy to handle as Samsung's monstrosity. Perhaps a bit less unwieldy, especially with bigger hands, as the thicker body and the soft-touch plastic actually allow for a firmer grip and more solid feel. The narrower chassis also makes for easier operation of the power/lock key, which on the Mega 6.3 is too thin and with a very shallow travel, like the volume rocker against it. To do simple thing, like pulling down the notification bar, or pressing the back key on both phones, you'd have to use both hands. 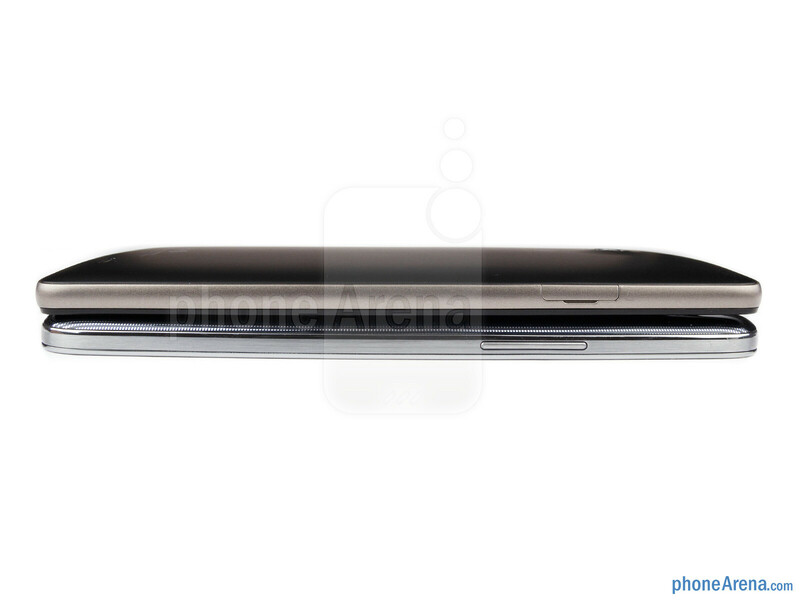 The Galaxy Mega 6.3 has, you guessed it, a 6.3” display diagonal, and the LCD screen sports 720x1280 pixels of HD resolution, just like the Ascend Mate. Huawei's phone has a slightly smaller, 6.1” screen, with respectively a tad higher 241ppi pixel density, versus the 233ppi on the Mega 6.3. The pixel densities are enough for decent readability, especially since these phones would be held further from your face than usual due to their screen size. Viewing angles are also quite good on both phones, with contrast and brightness shifting significantly only at extreme angles. Both handsets provide settings to adjust the screen tones – Samsung has its Dynamic, Standard and Movie modes, while Huawei simply put a slider that goes from warm to cold colors and in-between. The all-important screen brightness is a tad higher on the Mega 6,3 – around 450 vs 400 nits for the Ascend Mate – but its screen reflectance seems to be higher than on Huawei's phone, which makes it less visible outside in bright sunlight. 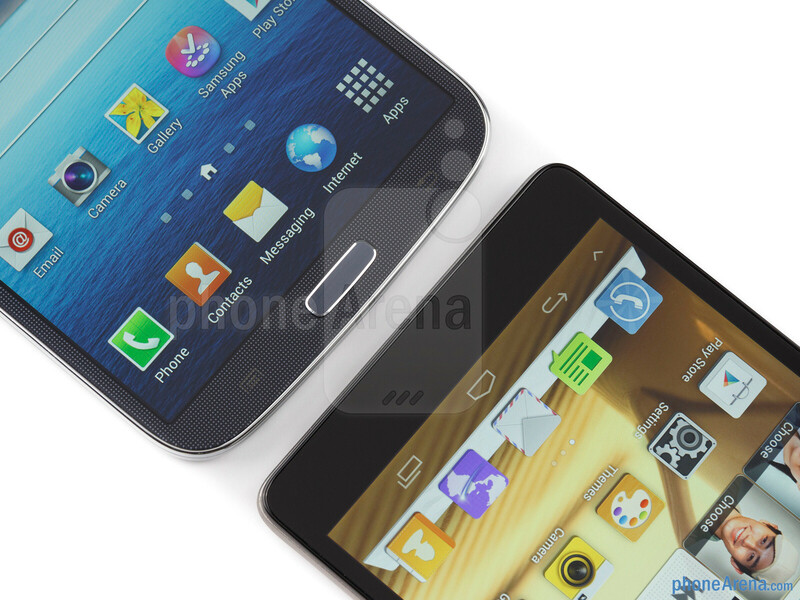 Samsung galaxy mega all the way!!! 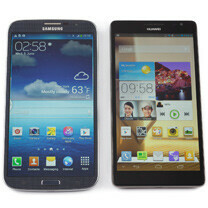 Huawei Ascend Mate all the way! When side by side like this, you can clearly see the blue hue that Samsung still have on their so called "black" color variant! And the pattern is pretty ugly, why not just offer a pure black without pattern, just like the ascend mate.. is it so hard Samsung? 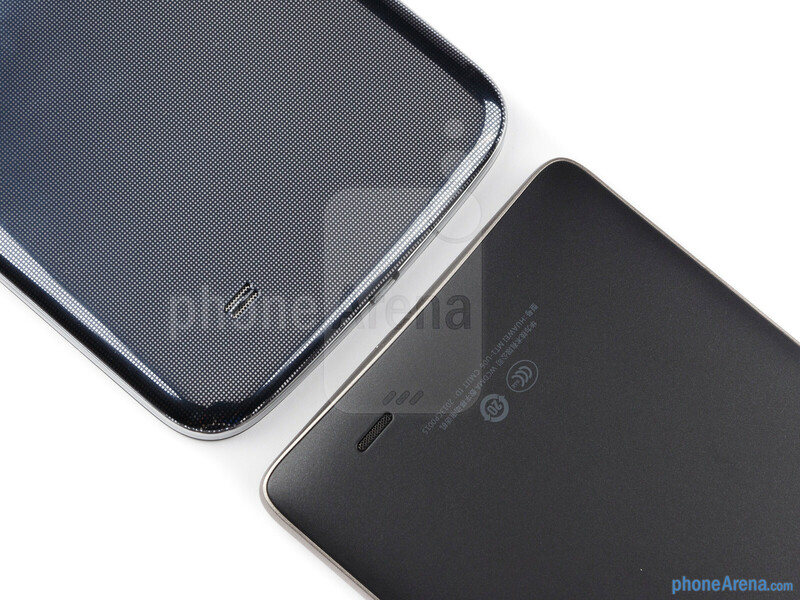 The Ascend Mate looks much better! Galaxy Mega is waaaaay better than the Ascend Mate...The mate's camera position plus back panel makes for an uglier combination versus Samsung's BEAST. Huawei Ascend mate won, which looks and feels better, has better sunlight visibilty, better call quality, better battery and in other fields, it is either competing with Galaxy Mega or is better. 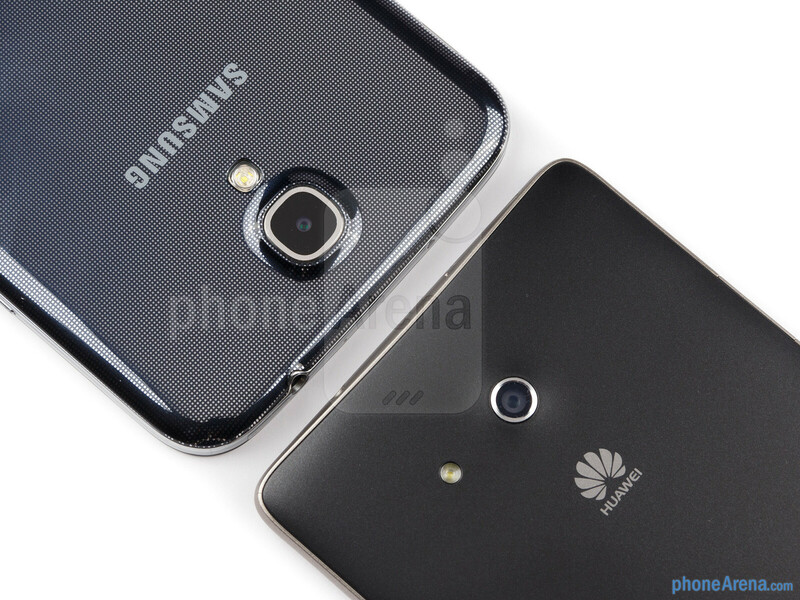 Only good thing Galaxy Mega has against Huawei's phone is is it's better camera. 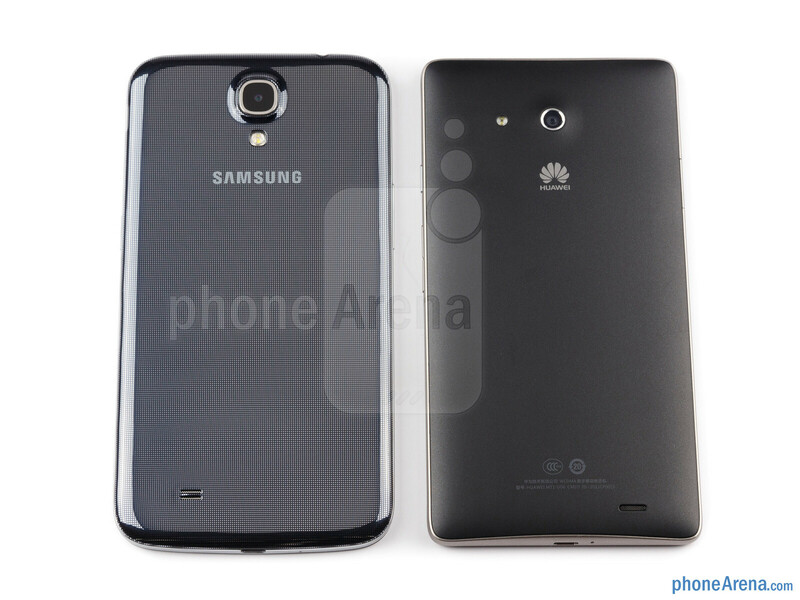 Apparently, some samsung fanboys just cannot digest the fact that Galaxy Mega lost to Huawei Ascend Mate. 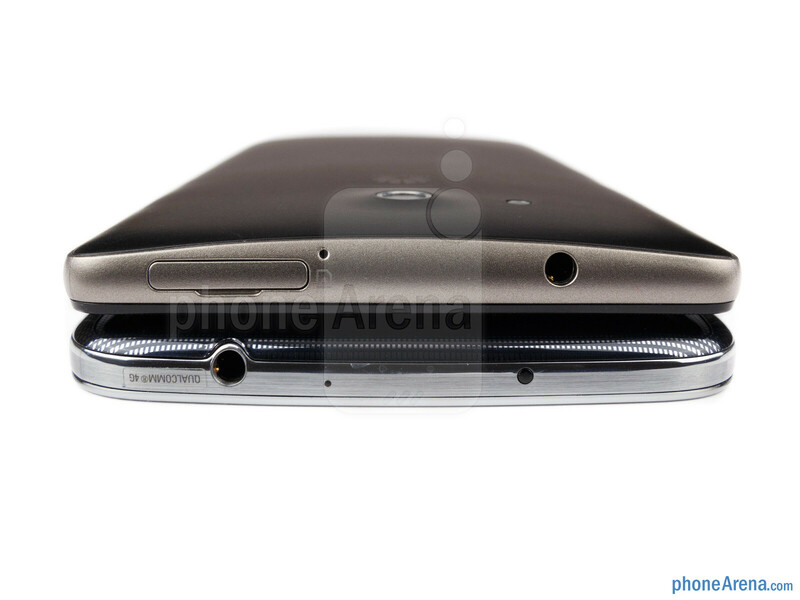 If you think Huawei Ascend Mate is worse than Samsung's Mega giant, then please, prove you point. I'm waiting. The Huawei asend mate is an awesome phone but the deal breaker for me was the terrible 3d gaming,its physically chunkier and the os roms on the mate crash. The Mega is faster with only a dual core CPU and a way better gpu, sorry I had both there is no way that the mate performs better in real time usage. Guys, u can't simply compare these 2 based on specs alone. Consider the price as well. I believe the Huawei will be very expensive than both Mega and Note series. 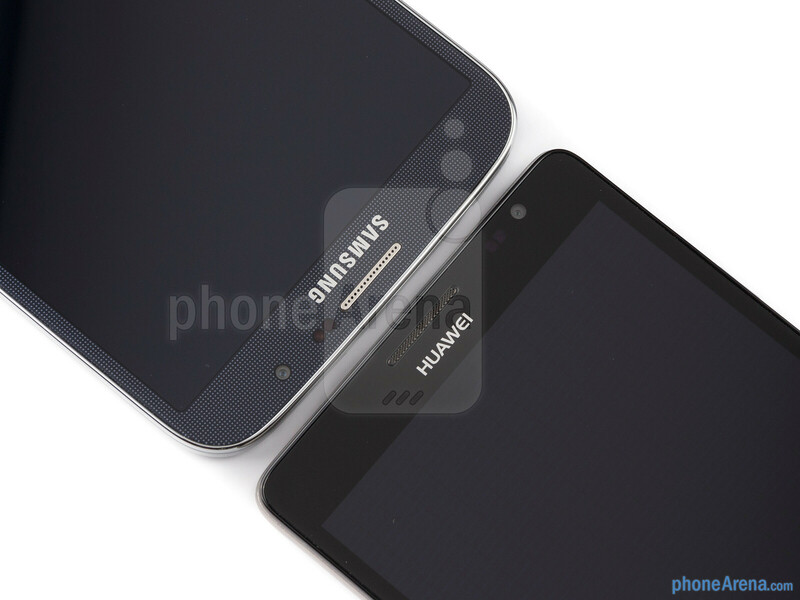 My personal preference would be an S4 Active or a Note 2. The Huawei ascend mate is an awesome phone it has a long battery life, fm radio, and i kinda like the square design, and its interface is fast. What I didnt like is the GPU which is bad games like real racing, need for speed, any 3d game lagged badly even simple games like samurai vs ninja lagged sometimes and load times are long. This was the deal breaker for me, I needed a phablet that was capable for gaming and everything else. If you dont intend on gaming it is a very formidable contender. I sold my mate and purchased a samsung mega 6.3 and have to tell you that the graphics processor is way better in fact I find that it plays need for speed better than my note 2 and the slim design is better I like the bigger screen and the bezel is smaller, not sure why some earlier said that the bezel was big. The Mega fits into my pocket as well and because its thinner it seems like it does not stick out as much as the Mate did. 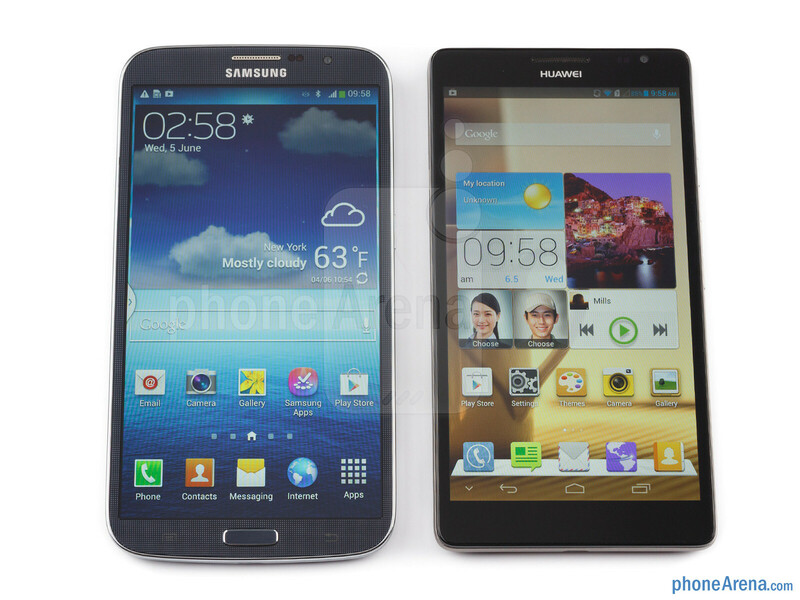 Yes I like the mega better the huawei ascend mate and the note 2. Oh also I forgot the huawei roms are buggy be prepared for that had several application crashes. If you can find a huawei ascend mate for around 350 it is not a bad deal but for me I need the whole enchilada gaming included so I choose the galaxy mega.